Dillingham Brampton Gurdon Dillingham, added 'Dillingham' so as to conform with the terms of his maternal grandfather's will. Letton Hall, near Shipdham, Thetford, was inherited from his father Thornhagh Brampton Gurdon in 1783. The 'family came into England with the Conqueror' (Burke's Peerage ..., 92nd ed., 1934). Dillingham died in 1820 and was succeeded by his son Theophilus Thornhagh Gurdon. The selected design was built of white brick with Portland stone dressings. The Doric porch was later replaced by a two-storey addition. Despite this and other nineteenth-century alterations, the estate buildings as a whole are intact and the interior is largely original. Since 1980, Letton Hall has been run as a Conference and Activities Centre and latterly as a Christian Conference Centre. The Gurdon Papers (compiled by Sir Brampton Gurdon and transcribed by Lord Cramworth, a Gurdon descendant, from the Gurdon papers in his possession, copy in SM green box files) show that between 11 July 1783 and 12 June 1792, Soane made 38 'journeys' to Letton Hall. On 18 January 1785, Soane left '2 setts of fair plans on six Sheets of Paper', on 13 February 1786 he was 'Making designs for the Offices', 15 February, 'd[itt]o another design', 25 February 'Making a fair draw[ing] of Offices'. On 30 March 1787, there was 'Delivered to Mr Dillingham in Jermyn Street plan of Stables for digger', on 7 June 'Sent a drawing for Fence & Park Gate', 27 August 'Drawings of Curtain Laths for the circular headed windows', on 5 November 'Drawings of finishings of the brewhouse' were followed on 7 January 1788 by 'a drawing of the finishings of the Brewhouse for the Workmen'. A 'fair Drawing of Sideboard on a sheet of paper' was sent by post on 11 June 1788. On 16 April 1792 Soane made a site visit to 'settle Offices, making several fair plans and also plans and directions for the Workmen' and on 12 June of that year he 'survey[ed] the Alterations to the Offices'. This seems to have been the last site visit. A summary of expenses shows that, in all, Soane charged two guineas a time for his 38 site visits and there were four site visits by 'Clerks to assist in measuring'. The 'Clerks time in making various fair drawings of designs not executed ' was 47 days charged for at five shillings a day. 'For making the several Designs execu[te]d making Drawings at large for the Workmen & for direct[in]g the Works from time to time - 5 p[e]r Cent on the Am[oun]t of the tradesmens Bills & the estim[ate]d Value of old Mat[eria]ls used £6000' [total of] £402:9:6' (Gurdon Papers, op.cit). There are in the Soane Museum Note Books 8-14, 19 that relate to Letton. Similarly, SM 'Journal /1787/No 1' has entries for Letton Hall from 11 July 1783 to 7 April 1792, pp.9-15, and May 1792 to 22 May 1793, p.59 that are similar but not identical with account given in the Gurdon Papers. 'Bill / Book 1 - Journal 1 / 1786 / 87 / 88' has the building accounts for: ironmongery &c dated 21 August and 9 December 1786 (p.58); carpenters work by Thomas Dove dated 12 December 1788, bricklayers work by Thomas Butcher dated 19 December 1788, plasterers work by James Wilkins, undated, painters work by Daniel Coppin, undated, masons work by J.Decarle, undated - total of £1065.8.10¼ (pp.83-108) and further bricklayers work by the same tradesmen dated December 1789 for daywork from 10 March 1788 to 3 November 1789 - total of £985.9.3½ (pp.169-178). MS indexes to the Note Books, Bill Books and Journals are currently only available for study at the Soane Museum. There are plans to put these online. 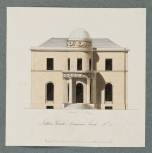 Soane published designs for Letton Hall in his Plans, elevations and sections of buildings executed in the counties of Norfolk, Suffolk ..., 1788 (i.e.1789) plates 7-11. Plate 7 (elevation) relates principally to drawing 21, plate 8 to drawings 10, 11, 12, plate 9 (bed chamber plan) to drawing 20, plate 11 to drawing 5. There are no drawings that tally with plate 10 and perhaps it relates to the missing design 2 of Soane's alternative designs designated by him as designs 1, 3, 4 and 'as executed'. (13-16) datable to 1783? or 1784? datable to 1783 ? or 1784 ? (18-19) David Laing (pupil 1790-6 - for another drawing by the same hand see drawing 16). See also H.Colvin, Biographical dictionary of British architects 1600-1840, 3rd ed., 1995 for Laing's unfortunate history.